Crossing the Goodland bridge, you momentarily lose the horizon and seem to ascend into the sky. Then - you come back to earth, the horizon reappears and in the distance you see mini-towers some five miles off in the distance. But, unlike most of the cars, you don't keep going - you make a sharp left turn at the Welcome to Goodland sign. As you turn a 60 X 15 mural painted by local artist - stares you in the face. Then you follow the winding road into a tiny village smaller than one square mile surrounded by water. There are about 400 year round residents here and everyone knows everyone, watches out for each other, and yet minds their own business. You discover Goodland when you discover her people - Goodland is it's people. Weekdays are pretty quite and serious. Come the weekend , Goodland jumps and the "hot spots" shake with the best entertainers in the state of Florida. Friday and Saturday the Little Bar jumps with live bands, theme parties and whatever else may be new. The Little Bar also has a Hog Roast in the fall. Everyone brings a covered dish (or you can pay). They have games - horseshoes, mullet toss, live crab races, music, dancing and beer. They have been written about in several magazines - more notably Sports Illustrated. There are many antiques here and a boat room with materials from the defunct "Star of the Everglades" that entertained several US Presidents. The bar is from Cicero - many of the trims etcetera from Chicago. The pipe organs are a story in themselves and the Papa Ray delightful. 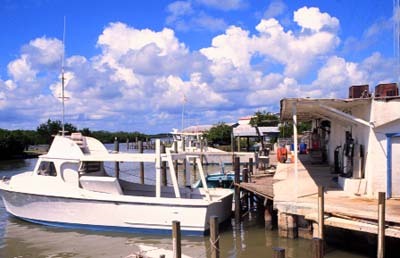 On the intracoastal waterway - the Marco Lodge was moved from Old Marco to Goodland January 4, 1964. The place was saved by A B Martin who had once lived in Goodland - from Miami and has his major business there. Over 1/2 million dollars was spent on the move and restoration. Entertainment off and on. The outdoor deck offers dining supreme - a feeling of a large cruise ship, especially at sunset. Also on the intracoastal, The Crabby Lady's smallness offers a delightful ambiance. It is all new except the tin around the wall under the windows inside. This is probably the oldest fish house in Goodland - the fish house also had the first lighted Christmas tree. Stan's , of course, is MUSIC, MUSIC, MUSIC, with an outdoor concert every Sunday of the year. Stan is our local celebrity. He writes his own music, sings, jokes and does the buzzard lope. The annual Mullet Festival draws thousands to the village to drink, eat, dance and get a glance at the new Mullet Queen and Princess. They also come to see Queen Mary who is here every Sunday afternoon and is known from coast to coast. Island Woman has the Men's Legs contest the first Saturday in March. It is hilarious and fun. Fashion shows are held dockside throughout the year. Many artist come to the village, sit along the banks and work on their canvases alone or with classes and groups.. The banks and bays amassed with boaters and buildings take on a special art form for the artist. Crab traps make a special view for the artist and photographers alike. The village also claims many fine and known artists. Anne Bianchi is a fine artist as well as a connoisseur of specimen shells from all over the world. Goodland is a place with only a few streets and no side walks. Children play and dogs and cats sleep in the streets. Biking and pet walking are times for good exercise - and fishing tops it all. Goodland is a fine place to live. In this place its difficult to tell a fisherman from a millionaire. When you leave and find you have enjoyed a journey into the past, we hope you take a little with you a and return again and again. You never know what is on the calendar in Goodland - something is always going on.